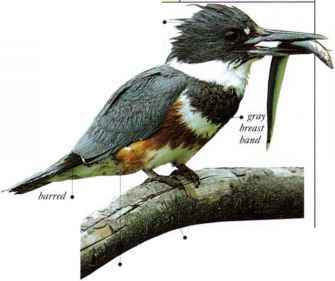 I his species lives in wooded lakes and rivers and feeds on acorns, nuts, seeds, green plants, and small invertebrates. It is one of the few ducks that perch readily on branches. Another characteristic feature is that it nests in trees. Soon after hatching, the ducklings jump down from the nest at their mother's call and follow her to the water. • nest A tree hole or nest box, lined with down. DISTRIBUTION North America to Cuba. 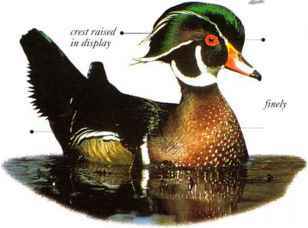 A shy, woodland duck, this species rests by day in shrubs overhanging water and feeds in woodland streams and lakes at dusk. 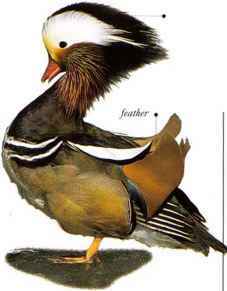 The male has a sweeping, bushy crest on its head and one enlarged, orange feather on each inner wing. The Mandarin prefers broadleaved woodland, especially oak, eating acorns and other seeds, nuts, plants, land snails, insects, and small fish. 1 NEST A hole in a tree, lined with down, often situated over water. • DISTRIBUTION Breeds in E. Asia. Winters as far south as S. China. Female • REMARK Introduced as an ornamental bird in S. England, which now has a significant part of the world population.